The Follo Line Project in Oslo is a revolution for tunnel-rich Norway. Previously, tunnels have mostly been built the traditional way with ex- plosives. 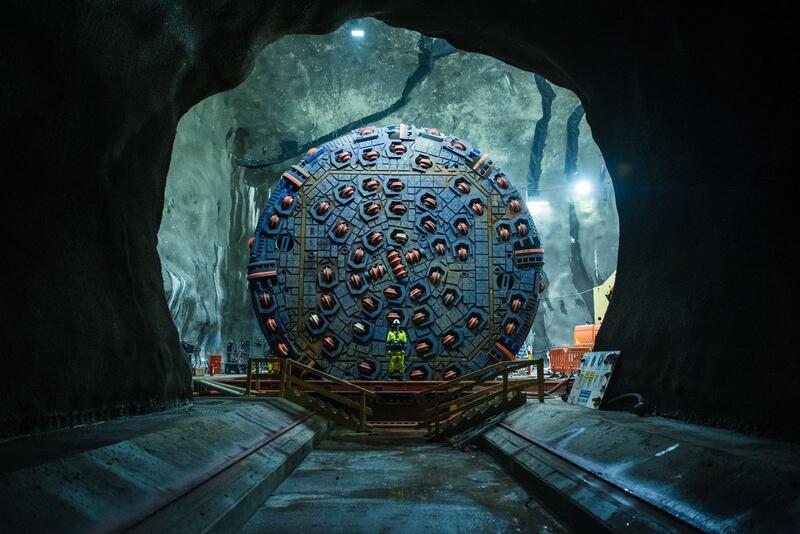 For the largest infrastructure project in the land of the fjords, tunnel boring machines are now being used. Since late 2016, four Dou- ble Shield TBMs from Herrenknecht have been simultaneously biting their way through the toughest hard rock for a new railway line. This finding is relatively new in Norway. Hoff Finnøy works on the Follo Line, the largest infrastructure project in the tunnel-rich land of the fjords.” Probably no state has more tunnels than Norway. For every inhabitant, statistically there are 1.3 meters,” says Anne Kathrine Kalager, Bane NOR‘s project manager for the main tunnelling section on the Follo Line Project. Previously, tunnels in Scandinavia have mostly been built with the traditional drill & blast method. Only in a few hydropower projects smaller tunnel boring machines were used. The best way to deal with the indigenous rock is by means of explosives, because tunnel boring machines would have a tough time with it – for a long time that was the prevailing opinion. The Follo Line brings movement into this tradition. Using mechanized tunnelling technology, the large-scale project is creating the longest railway tunnel in Norway and eliminating a bottleneck in the trans- port network of the future. The new twin tube will run 20 km from the municipality of Ski to the south of Oslo right into the center of the metropolis – with an open section at both ends, 22 km in total. Four million cubic meters of rock have to make way – almost double the volume of the Cheops pyramid. In future commuters will save eleven minutes on the short route, half of the current travel time. In contrast, the TBM solution gets by with only one central point of attack. 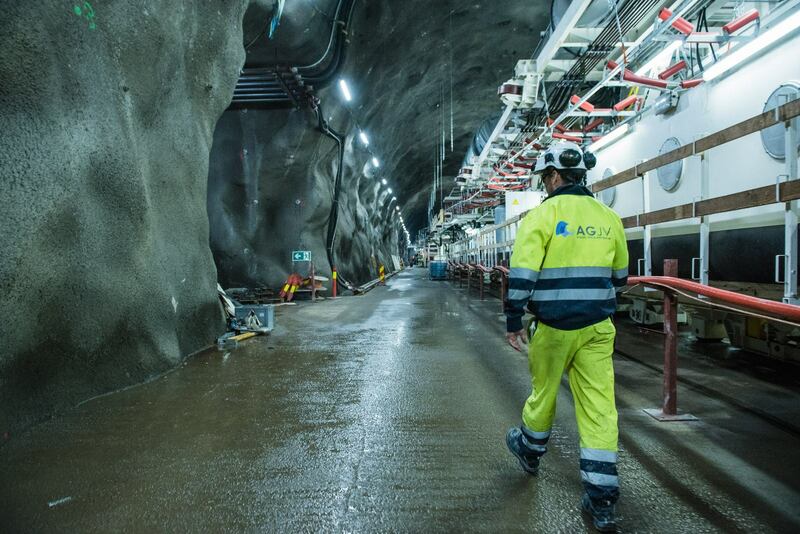 Two 900 m long access tunnels connect the large Åsland jobsite on the surface with two underground caverns. From there, two machines each bore south and north initially served as assembly site for the four TBMs and are now used as logistical nodes for the drive. The large jobsite is linked directly to the E6 highway. There are no nearby residents to be disturbed by the years of construction work. “All these advantages were decisive for the TBM solution,” explains Anne Kathrine Kalager. When the project is completed, the tunnel portal will be located just a few hundred meters from the main railway station. Kalager lets her gaze wander to the harbor and the spectacular opera with its glass facade and bright Carrara marble, building cranes, new residential blocks and modern office buildings right on the water: Oslo is booming.” In recent years, we Norwegians have learned to think more and more about the future,” says Kalager. For example, every second new car in Oslo is electrically powered, and throughout Norway the electricity for this comes almost entirely from emission-free hydropower. The country does not touch its treasure from the North Sea oil of about 160,000 euros per inhabitant, it invests the gigantic sum of 832 billion euros in a state fund to secure prosperity for future generations.” Half the Norwegian population lives within a radius of 100 kilometers around the capital,” emphasizes Kalager. For the trains to whizz through the mountain at up to 250 km per hour from 2021, the breakthrough of the two tubes must be achieved by the end of 2018. For this reason Fernando Vara reaches for his smartphone every morning at 6.30 a.m. “So in the first minute after waking up I can see if the day is going to be stressful,” says the Spaniard with a grin. The 47-year-old is the project director of the construction joint venture, which is made up of the companies Acciona from Spain and Ghella from Italy. Early in the morning, Vara first checks the WhatsApp group, where the night shift reports the progress of the previous day. The Double Shield machines can simultaneously bore and line the freshly bored tunnel with rings made of 1.8 m wide reinforced concrete segments. “Ten rings are good when the geology is difficult. But 14 or 15 rings are normal,” says Vara. So that usually means an advance of 27 m per day and machine. The factory acceptance for the first TBM in March 2016 took place eleven months after the order was received. There were only 19 months between the signing of the contract and the fourth and last machine beginning operations in Oslo in November 2016. At times some thirty Herrenknecht service experts were on site at once actively supporting assembly of the machines. “So we were four months ahead of the official schedule with the TBM launch,” says Vara, who is responsible for the daily work of around 500 people on the large-scale jobsite. Being under time pressure, potentially excessively overworking the machines and thus risking major damage with long downtimes would be a nerve-racking undertaking, he emphasizes. “But thanks to the head start in the schedule we can now work with great concentration and yet also relatively relaxed. We are making even better progress than expected.” According to the project partners the four TBMs had excavated two thirds of the total distance by March, 20, 2018. Among other things, engineer Luis Paliza Cuartero is responsible for Herrenknecht‘s cutter management in Oslo. He ensures that the removed, worn disc cutters are loaded onto trucks and transported to the Herrenknecht plant 1500 km away in Schwanau. There they are completely overhauled for reinstallation. “In close cooperation with our customers we feel our way ever closer to the optimal parameters for the disc cutters,” explains the Argentinean. “We improve details on the bearing and try out the effects of different lubricants and seals.” Up to 50 refurbishment experts at the Herrenknecht headquarters work on the professional rebuilding of the disc cutters so there are always enough fresh excavation tools available in Åsland and the contracting joint venture can take care of other tasks. “This process works like clockwork,” reports Francesco Giampietro happily. As a long-time TBM manager with Ghella, with a total of 140 employees he is responsible for ensuring the four 150 m long power packs are tunnelling at all times if possible. “I‘ve never had to deal with such hard rock in my whole career,” says Giampietro with a laugh. His laugh is that of a man who knows he is facing a great challenge but is also confident he can cope with it. “Hard rock and four machines at the same time: that means we all have to work together very closely and trustfully to be successful,” emphasizes Giampietro. On average, seven Herrenknecht specialists are on site every day to assist the TBM manager and his people with incidental maintenance and repairs, but also to support the advance. So-called multi-service vehicles (MSVs) ensure a demand-oriented supply of disc cutters, spare parts and in particular reinforced con-crete segments for the tunnel lining. With four trailers coupled to each other, these special vehicles designed and built by Herrenknecht subsidiary TMS can load up to 125 t and thus tow the concrete segments for two complete segment rings to the TBM in one trip. The rubber-tired vehicles can be used very flexibly on the jobsite. Inclines and declines of up to 10 % and the tightest curve radii of 15 m are not a problem – the basis for ensuring the continuous advance stops as seldom as possible. 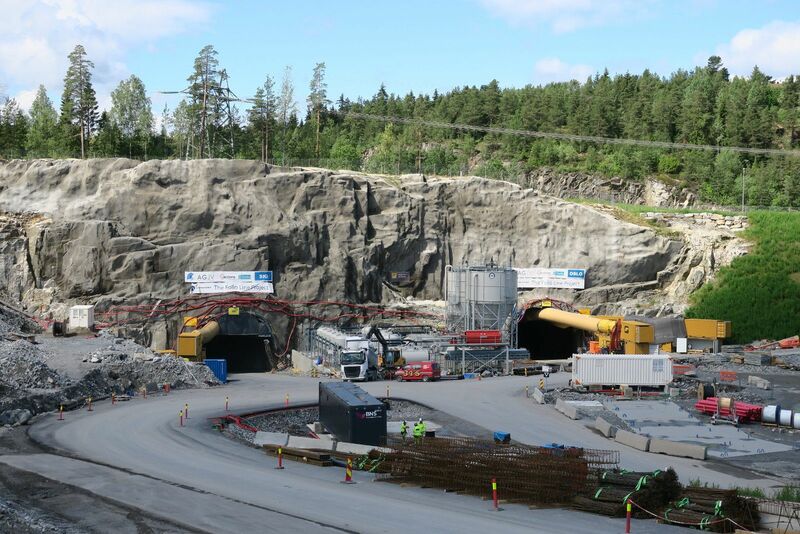 In Norway, where the whole industry had long been focused on drill & blast while smaller TBMs only have performed in water projects, many assessments and analyses were needed before the decision for the TBM as the best solution was made, recalls Kalager. She expects the Follo Line to send a signal for further projects in Norway.